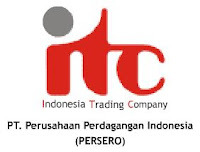 PT Perusahaan Perdagangan Indonesia (Persero) - Indonesia Trading Company or ITC, known in Indonesia as PT Perusahaan Perdagangan Indonesia (Persero) or PPI, is the only Indonesian state-owned trading house. Its business is in export, import and distribution. ITC was formed through the merger of three former so-called "Niaga" companies, state-owned trading companies PT Tjipta Niaga, PT Dharma Niaga and PT Pantja Niaga, on 31 March 2003. These three ex-"Niaga" belonged to the so-called "Big Five" of the colonial period of the Netherlands Indies, which were nationalised in the 1950s. Machinery and equipment (medical equipment, agricultural equipment, heavy equipment, vehicles). Food and beberage (in particular alcoholic drinks, as official importer appointed by the Indonesian government). For detailed information, please refer Apply on following link below. If you feel that you are the person we're looking for, send your complete application to email: Balikpapan@tradingindonesia.com, or by post to address: PT. Perusahaan Perdagangan Indnesia (Persero) Jl. Gajah Mada no. 22 Balikpapan. All applications will be treated confidentially.